Es Una . : Sequins and Sand Resort Wear :. Sun Protection and Body Confidence. Now that got our attention! But that's what Es Una is all about. Beach Dresses that offer maximum Sun Safety, for those who don't want to wear a rashie. Es Una offers stylish Rashie Dress options that you can splash around in too! But the goodness doesn't stop there. This Australian label is made from 100% regenerated fibre; 78% recycled nylon and 22% Xtra Life Lycra®. It has been tested by the Australian Radiation Protection and Nuclear Safety Agency, receiving an ultra violet protection factor (UPF) rating of 50+. This means it is in the 'excellent' protection category, reducing solar ultraviolet radiation (UVR) when it covers your skin. 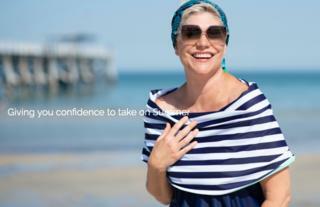 You can be confident that you're making a sun smart decision when you wear Es Una to the beach, pool or as resort wear. Lyndal, Es Una's founder, is a woman on a mission. To change what we wear to the beach, to give us more confidence and coverage. Her research showed that 60% of women aren't traditional rashie fans and were looking for more of a dress option for the sun. "the result of having little to no options when it comes to rash vests for women...we simply don’t wear them! With no other alternatives, we've resorted to wearing kaftans and cover-ups just to spend time at the beach. Worse still, we withdraw from the sun and sand altogether and stay back at the beach house instead of joining our family and friends. So that’s how it all began for Es Una. We recognised that there were a lot of women who lacked the confidence to step onto the beach in their bathers, so we’ve designed our own ‘Es Una rashie dresses and Summer snoods’ to give you both sun protection and body confidence." We know many of you will breathe a sigh of relief when you see this new Australian swimwear label. Fuller coverage swim dresses, rashie dresses that you can swim in, wear from the beach to the bar in confidence and style. Thanks for filling this gap for us Lyndal. We wish Es Una every success in the world. We know there will be many women grateful and appreciative that finally, they can get out and enjoy their lives in the sun. You'll also find the Es Una range in the Sun Safe & Rashies section of Sequins and Sand. Below is fabulous Evie in the striking Shoulder Shrug Rashie Dress in Orange.